Process Explorer, the popular tool for inspecting and controlling processes and threads under Windows, comes in a new version with GPU support. You can download Process Explorer v15.0 from this page. As you can see on this screeshot, the GPU usage is not 100% under FurMark 1.9.1 but it’s around 50%. Why? 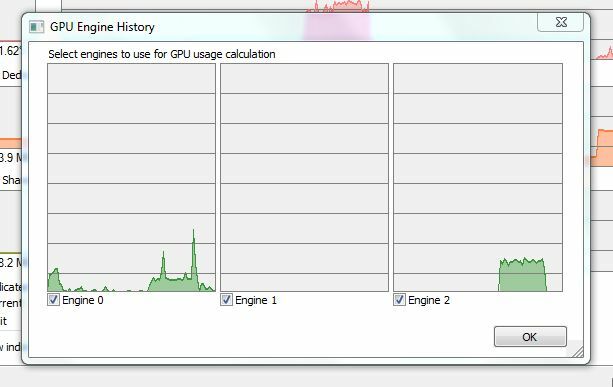 Because Process Explorer does the same thing than for CPUs: by default, it displays the GPU usage of all GPUs in the system. On my current system, I have a GeForce GTX 460 and a GeForce GT 240. The GTX 460 is the primary graphics card and I ran FurMark in windowed mode leading to a 100% GPU usage for the GTX 460 and 0% GPU usage for the GT 240. The total GPU usage is (100+0)/2 = 50%. 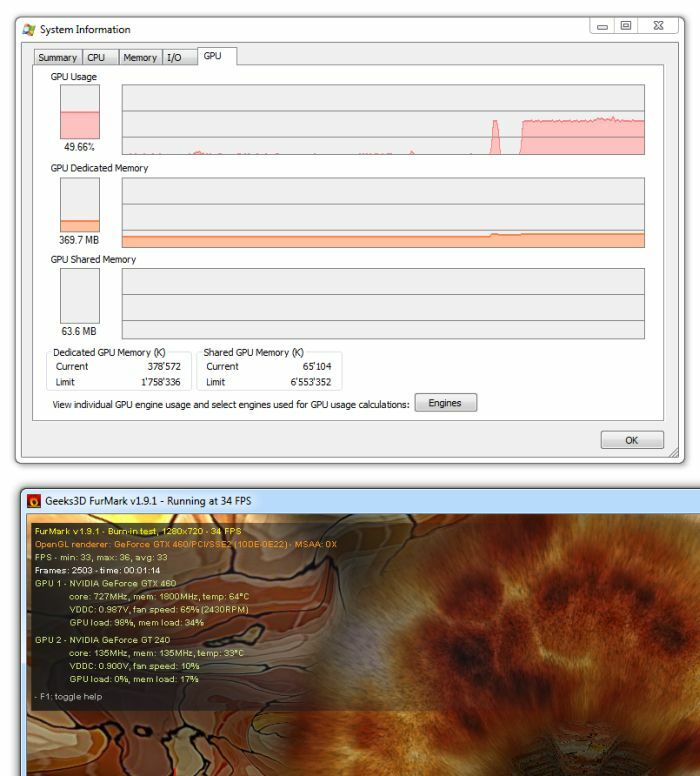 On a system with a single GPU, the monitor display a 100% GPU usage when FurMark is running, while on a multi-GPU system, I didn’t manage to read the GPU usage of the GPU running FurMark: only the usage of all GPUs was displayed. 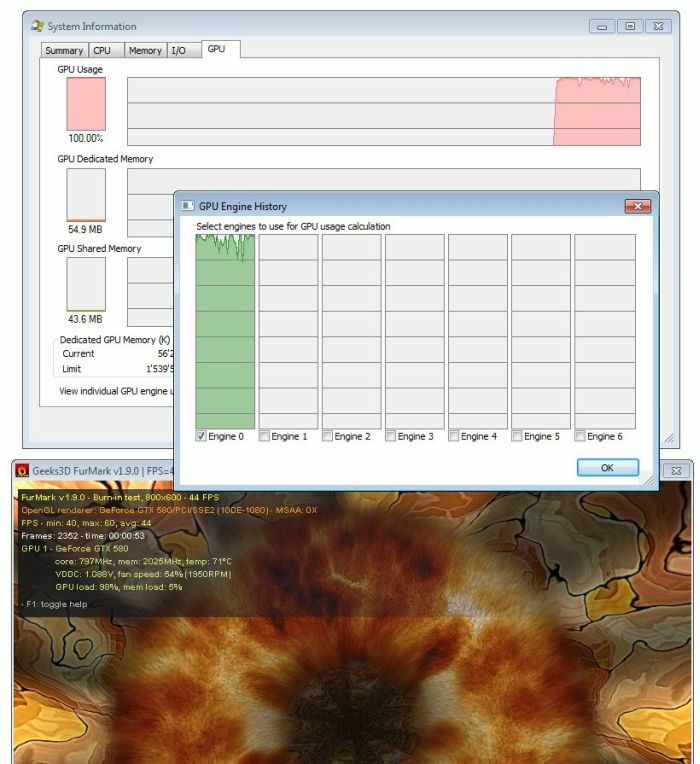 OMG, looks like first tool that shows memory usage and real gpu usage on AMD cards. On HD4870 thare are only 3 Engines. Standard 3D apps use Engine 0, but when I played HD movie using MPC-HC with DXVA, engine 2 was used too. @Virus: thanks for the screeny. Hey JeGX, any idea on what Windows Vista API the Sysinternals guy used? I wonder why no other GPU tools have done this before. It is fascinating to see where your GPU memory goes. Currently using 400MB out of 1GB. Most of that goes to DWM (Windows Aero) and IE9 (with about 25 tabs open). I ran FEAR 3 and it went to 880MB with 2xAA and 966MB with 4xAA. Shows that you should close any background programs if you want to get good AA performance from a game. 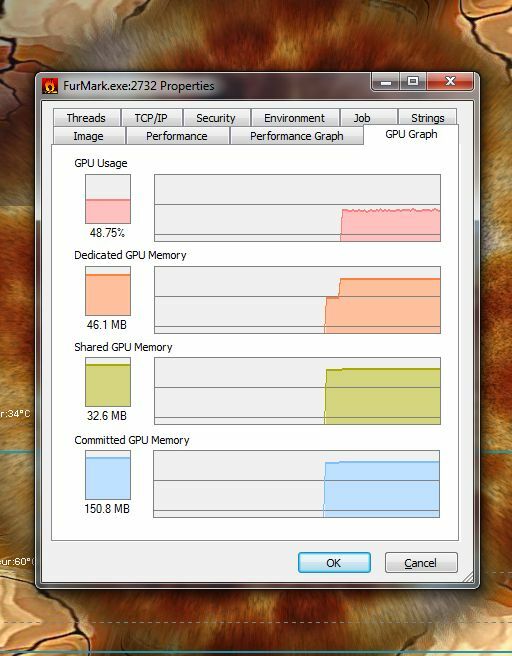 awesome..ive been looking for a program that can show processes using the GPU for a while..
Engine 6 shows usage when a 3D app is running..
Engine 12 shows usage when engine 6 maxes out..
all other engines show 0..
i was thinking it maybe an engine for textures, and engine for physx, one for opencl..but that doesnt seem to be the case.. Check out newest Process Hacker 2 tool. It’s now quite comparable to Processexplorer with even more goods (check the plugin support in options) and has GPU monitoring graph too!! also on Radeons.